Looking for the perfect recipe for how to make pork gravy? I was too which is where this simple and easy gravy recipe came from! When you make a pork roast, you end up with delicious pan drippings that are just yelling to be made into a savory pork gravy. While pork roast can be a simple and healthy meal, for special occasions I do sometimes like to add a little bit of gravy. 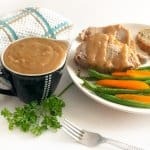 Try my easy and flavorful pork gravy recipe that goes splendidly with my pork roast in the crock pot to add a savory and creaminess that is hard to resist. 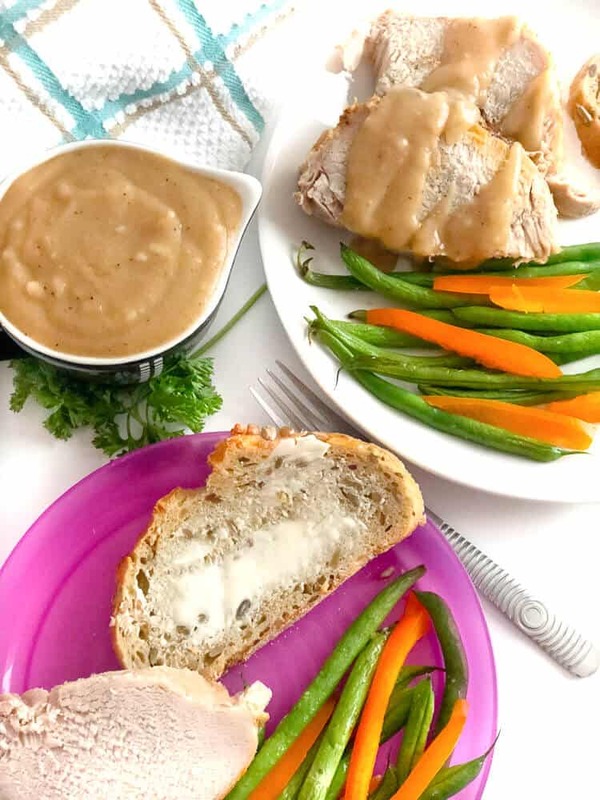 This recipe makes a small batch gravy, so if your family prefers a heavier pore of creamy gravy or you a feeding a crowd, you may want to double the recipe. Full truth, for the longest time I bought gravy. I’d go through the process of making a pork loin or another large cut of meat, and I’d throw away the drippings. But those drippings are packed full of flavor and goodness that you often just don’t get with store-bought gravy. Plus why waste a good thing when it only takes a few minutes to make your own- it’s frugal and delicious. In about ten minutes you can have a homemade gravy with just a few ingredients. Make it while your pork loin rests for a few minutes after you take it out of the crockpot or the oven. It’s simple, delicious and the perfect brown gravy for a special occasion or Sunday feast. Anyone, and I mean anyone can master making homemade gravy from scratch. Melt a couple of tablespoons of butter, then add the same amount of flour. Sautee for a minute with any spices. Add pan drippings and broth slowly by quickly whisking it together to keep it smooth and creamy. If desired, add a little more black pepper to taste for a kick! I think a lot of people are intimidated making homemade pork gravy because they worry about lumps. Using a whisk when you add the broth is an important step to ensure your gravy is smooth. If you use this recipe, you can substitute any broth you like in place of the pan drippings. Your gravy will not have as much pork flavor to it, but will still be delicious. I also recommend sauteeing a little onion and garlic into your butter to give it a little more flavor if you’re making gravy without drippings. This homemade pork gravy goes perfect with pork loin made in the crock pot! Use the recipe below, and supplement extra broth if needed. Depending on how you cooked your pork chops you make only have a little bit of drippings in the pan, finish it off with more broth to make up the difference in liquid and fill out your gravy. This gravy recipe is delicious on pork chops. Using a fat separator, you can reduce the amount of fat in your pan drippings. While fat is not always something to be avoided, reducing the fat from your drippings will give you a leaner gravy. Gravy isn’t really lean or healthy food, but using only a small bit also helps. If sodium is something you’re watching (which I try to do for my family), opt for a low sodium broth. We make gravy in a small batch at our house so we enjoy just a little with our meal. Gravy isn’t the only sauce you can use to give your roast pork a flavorful sauce. Salsa verde is delicious on pork as is applesauce (especially homemade!). A mustard and apple cider vinegar sauce go nicely on roast pork as do most barbeque sauces. This gravy would be delicious on my Pork and Zucchini Meatballs recipe for a spin on Swedish Meatballs. Add a little water to thin it out if you try it! You can use cornstarch as a substitute for flour to thicken your gravy. Simply use half as much cornstarch as you would flour in your gravy recipe. I’ve seen people use coconut flour in gravy in place of wheat flour, but I haven’t tried it myself. Some friends have said it is a little more gritty than a regular gravy. If you need a gluten-free version I would make sure to whisk things well if you decided to try coconut flour. 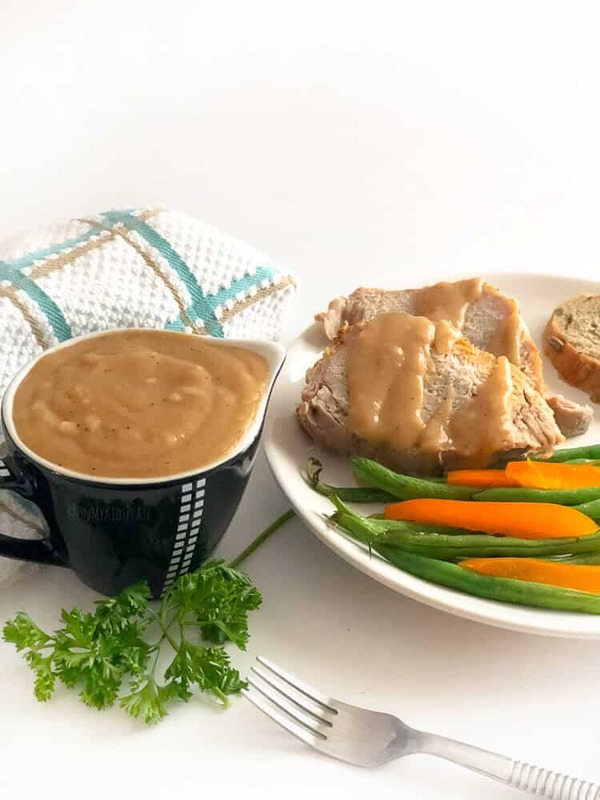 Simple, flavorful and delicious homemade pork roast gravy from the leftover pan drippings makes for an amazing sauce for just pennies compared to buying it in the store. This gravy is easy and fast, cooking in less than ten minutes. 2 cups pan drippings liquid If you don't have a full two cups, supplement with broth. In a saucepan melt three tablespoons of butter. Stir in flour to butter and let brown for one minute, stirring frequently. This creates what's called a roux. Add pan drippings and any extra broth to butter and flour mixture. Use a whisk to distribute the flour evenly within your liquid to avoid lumps. Add salt and pepper, tasting your gravy. Add more pepper or salt a little bit at a time to your own taste. Allow gravy to cook for three to four minutes. Pour into a bowl and enjoy with your dinner! This recipe makes about a cup and a half of gravy, which equals a serving size of a quarter cup of gravy per person. Our family prefers just a little gravy on our meal. If your family prefers a heavier pour of gravy, I'd recommend doubling the recipe. So have you made homemade pork gravy before? What are you putting this delicious gravy on top of? Oh my gosh. I just made this with drippings from a half pork tenderloin and it is delicious. (Don’t tell anyone that I’ve never made gravy before…and I’m from New Orleans!). This will be so nice for a special meal. Thank you! What type of broth do you use if there aren’t enough drippings? I’m also a big fan of the brand Better Then Bouillon, they have a great line of bouillon bases for broth in a bunch of flavors including low sodium chicken, a really delicious garlic flavor, or the seasoned veggie flavor. You mix them with water to make broth, they are a concentrated paste. I tend to stick to those more as they go well with all kinds of dishes, not just this pork gravy as the jars make enough broth for multiple dinners. Don’t let that stop you though from using whatever broth you prefer if you have a favorite. Hope that helps! Having made homemade pork gravy, can it be frozen? Anf for how long? Yes, you can freeze this gravy as it is a flour based gravy. Gravy like this usually keeps well in the freezer for about four months. Creamy gravies with dairy separate when you defrost and are the kinds that don’t freeze as well. We want lots of gravy! Not enough drippings to “double recipe”. What can we substitute for “missing” drippings? Hi Phil- You can add your favorite broth to make up the difference missing in drippings, your drippings will still pack tons of good flavor. When I double the recipe I’ve also added a quarter of a diced onion and/or a rib of celery diced to the butter in the very beginning of the recipe to give it a little extra flavor kick (While I’m melting the butter), but it’s not something you have to do if you don’t have it on hand. Hope that helps! I had a little experiment when making pork gravy. I mixed butter and flour with a little water. Added the juices from the pork shoulder. I wanted to add cider but didn’t have any so I got some gala apples cut in pan of boiling water. Just enough to cover them. Added brown sugar and then mashed them. I added that to the gravy and stirred. Salt and pepper. Then I sieved it and I’m not kidding. Gravy heaven!! !